It’s almost time to pile up your plates, squish around card tables on folding chairs, and sit tightly under Thanksgiving tables. Do you know what you’ll talk about? Do you know how to fill that sacred time with meaningful truth for your family? 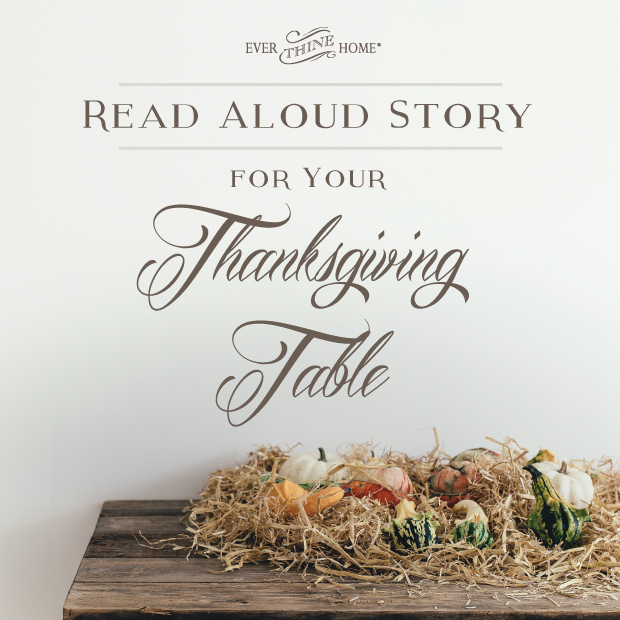 Here’s an easy read aloud story for your Thanksgiving table. Short, practical, and ready to focus your loved ones on the source of genuine gratitude. David Livingstone was a missionary to Africa. When he was twenty-seven years old, he traveled from England to South Africa with new ideas to help the people of that continent learn about Jesus Christ. One of his ideas was that African Christians should be trained to reach their own people. Though this seems like common sense today, when Livingstone suggested it in the 1840s, he was ridiculed. Soon after they arrived, a lion broke into one of the cattle pens. Livingstone raised his gun and fired both barrels. The lion jerked back and roared. Quickly, Livingstone reloaded. Mebalwe yelled a warning. Livingstone looked up just as the lion sprang. It caught David Livingstone’s shoulder in its huge jaws, crushing the bone. Both man and animal rolled in the dust. When the lion came to its feet, it shook the missionary like a rag doll. Livingstone later recalled thinking, What part of me will he eat first? Mebalwe raised his gun and missed. The lion immediately dropped Livingstone and charged the African teacher, clamping its teeth into the teacher’s leg. A villager tried to spear the lion, but it turned and charged toward him. Suddenly the lion fell dead as Livingstone’s gun brought him down. The seriously injured missionary had managed to get his gun and shoot the lion a second time. The other nearby lions watching and waiting for the kill ran off and did not return. But the badly injured Livingstone and Mebalwe needed medical attention. They were taken back to their mission station and then were transported to the coast and the mission headquarters where they were treated for their injuries. While there, David Livingstone wrote to his father in Scotland, praising and thanking God for saving him from great danger. Even though he wasn’t delivered from the teeth of the lion, he was grateful he was not killed. He knew that was by God’s hand. Sometimes God doesn’t deliver us as we wish He would. Sometimes there are accidents and people are hurt. Sometimes we get sick and suffer. When Jesus died on the cross it might have looked like God made a mistake. But we know God was in control. Yet God did not make Judas betray Jesus or stir up the crowd of men who demanded his death or tell the soldiers to mock and spit on Jesus. It was Satan, the devil, who was behind the evil things that happened. Somehow, the God of Heaven and the devil of Hell both participated in the exact same event when Jesus died on the cross. The same is true of David Livingstone. God did not make the lion charge the animals and the people. But God did keep the men alive and helped them heal with the skill of the medical workers in the mission headquarters. It’s a great mystery to us how God works and how much the devil can do. But our job is to thank God in all things knowing He can bring good out of anything that happens to us, whether we are delivered freely or whether we suffer pain as David Livingstone did. As long as we are alive, may we be found praising and thanking God for all that happens in our lives knowing He loves us and wants good for us in all things. Can we give thanks when God doesn’t rescue us? Ask these questions to get the table conversation going. -Why do you think God didn’t stop the lions from attacking? -What do you think the villagers thought and said to each other about the missionaries who came to their rescue? -Even though there was no miracle, did God make Himself known to the villagers? When you have been in a hard place and have been attacked by a friend’s words or hurt physically by something, did you remember to thank God? It’s not easy to do. 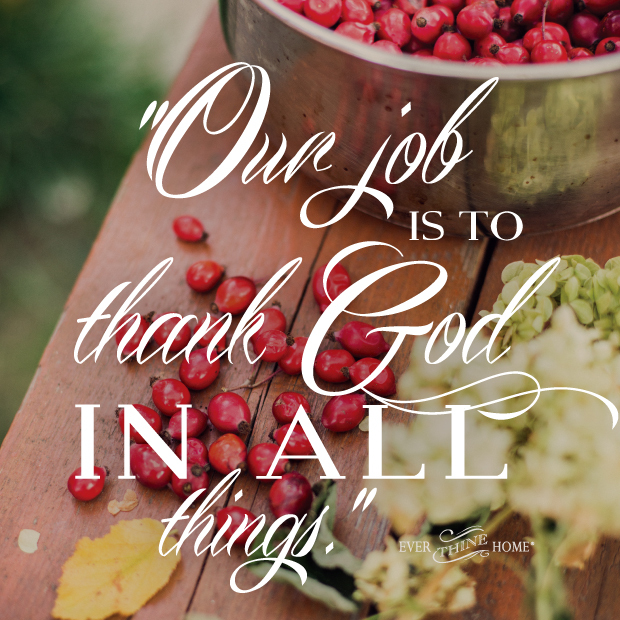 We can choose to give thanks in all things, even when God doesn’t deliver us as we wish He would. God is always in control. For more encouragement like this, look for our weekly Advent series, to start conversations of meaning and truth throughout your holidays.